My previous visit to Scusa brought me to meet Chef Gianluca Visciglia for the first time. I told you about a bit about his fantastic burrata back in one of those craving posts and quite soon I will also tell you a story about my dinner there. Taking pictures of the chef cooking and eating risotto for my article for The Foodie Magazine was quite a challenge, especially when knowing that the venue, which was Scusa, has a dark tone all over the place. Based on my modest experience as a blogger/writer, I managed to find some good angles to finish the job. As the reward, Chef Gianluca cooked us all his mother’s recipe for risotto alla Milanese. 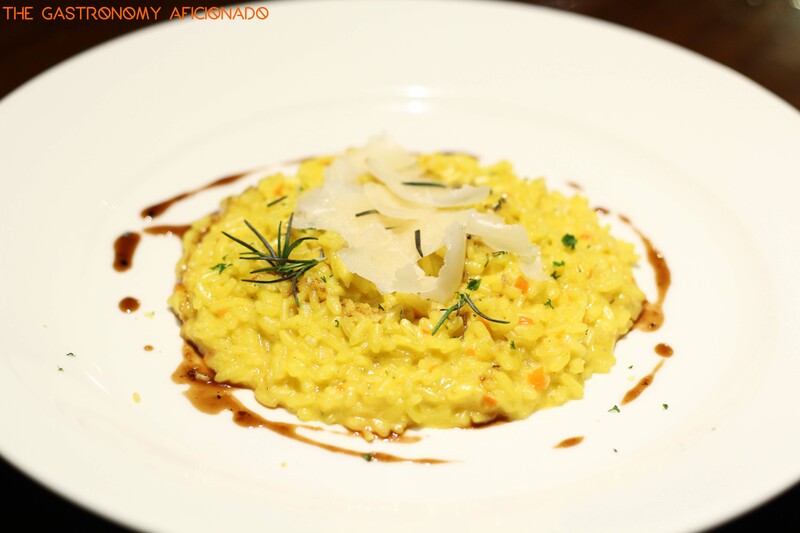 Born in a small town nearby to Milan itself, he was influenced heavily with the cuisine style of the city and for risotto, the simplicity of how it looks actually brings out the whole flavor. He’s really good at at what he do, naturally as a chef of course, but especially at how he can emanates the emotion from this dish based on his childhood experience. It was a majestic treat. The trace of saffron was so inviting and the richness that came out from the chicken broth and the cheese was so illuminating. That’s a well-deserved lunch for me who was at that time, had not had my lunch yet! Thank you again for your treat, Signor Visciglia!